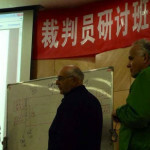 US-based officials from the AFL, and NCAA – Carl Pagnotti and David Cuttaia at the whiteboard, working with Chinese officials during training at Wuhan. 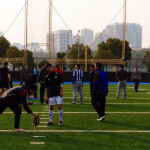 Chinese University players running plays on the arena-sized outdoor practice facility in Wuhan. 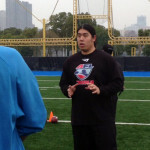 NFL veteran Ed Wang, part of the US coaching team, giving hands-on demonstration during classroom work. 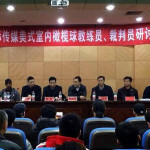 AFLC Coaches and officials, along with Ganlan Media International executives, interacting with Chinese University hopefuls at Wuhan Sports University. 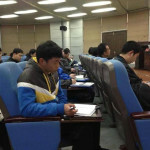 Chinese University coaches, officials, and players taking part in week-long classroom instruction. 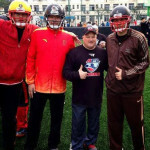 Director of Operations, Ken Bozarth, a good sized former player, with some of the Chinese collegiates. 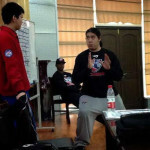 Former NFL player Ed Wang coaches the Chinese players. 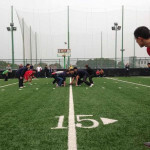 Training camp in full swing on the new outdoor field.